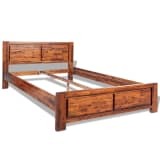 vidaXL Bed Frame Rough Mango Wood 70.9"x78.7"
The most important piece of furniture in your bedroom is without any doubt the bed. Make sure you spend enough time picking the perfect one for you. The most important quality of a bed is that it’s comfortable, so that you wake up well-rested in the morning. Therefore, at vidaXL, you can find several amazing and cheap single and double beds – both with or without the mattress included. Keep on reading for more information about our furniture collection. The goal of vidaXL is to keep the selection as diverse and varied as possible. This is why you can find a lot of different bed frames in our web shop. We offer different sizes, single beds, double beds but also sofa beds, bunk beds and box-springs – so there’s always something there for you. 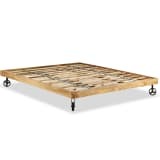 What all our bed frames do have in common, is that they are very comfortable. Buying a bed frame online doesn’t look that crazy anymore, especially when you know that we have free delivery on all our products! When you want to add something special to your bedroom, we have some models we can recommend. Choose to get a bed with LED lighting, for example. This way you easily create a cosy atmosphere by selecting the colour of the light, which you can set yourself with a remote control. 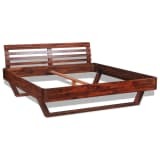 Another option is to get a bed frame with a special shape, like a round or wavy bed frame. These soft shapes give your bedroom a pleasant appearance. If you always have a lack of space, we recommend our beds with storage in the shape of a drawer or even the whole space below the bed can be used as storage. Also have a look at our duvets and duvet covers, to finish the look of your bedroom. At vidaXL you can find frames made from different high-quality materials. Materials that are often used are artificial leather, fabric, wood and metal. Dependent on the rest of the furniture in your bedroom, you can select a fitting material. A metal bedframe with curling shapes gives the room a romantic look, while a wooden bedframe will give the room a more rugged look. Our mattresses are also make of high quality materials, so you can have a good night's sleep. Kids and sleeping are not always a match made in heaven. Turn going to bed into a party by getting a fun bed. At vidaXL you’ll find several fun children’s beds, like a bedframe in the shape of a fire truck, or a castle. Can you just image? Children no longer protesting when they have to sleep, but running upstairs on their own? You can do it with our fun beds!